As the final serve crossed the net on Nov. 18, Green Bay’s women’s volleyball team prepared their defense against Northern Kentucky. When the Norse sent the ball soaring out of bounds, the Phoenix hit the ground, celebrating a victory they sought for years. With the help of sisters Taylor and Jessica Wolf, Green Bay won the Horizon League women’s volleyball championship, earning an automatic bid to the NCAA tournament on Nov. 29. The championship run started for Green Bay on Saturday, Nov. 17, as they played the UIC Flames in the first of two semifinal matches. During the match, both teams fought hard to make it to the championship round on Sunday, but only one could come out on top, and that was Green Bay. Winning 3-1, the Phoenix took down the Flames. The story of the two sisters from Waconia, Minnesota, continued as they led the team in kills. Taylor finished the match with a double-double, recording 24 kills and 11 digs. Jessica made an impact of her own with 17 kills during the four-set match. With their kills alone, the Wolf sisters had 41 out of the team’s 65 total kills. As this match concluded, No. 3 Northern Kentucky and No. 2 Cleveland State prepared to take to the court, fighting for the second spot in the finals. It only took three sets to decide the winner of this matchup, and Northern Kentucky came out with the win. Northern Kentucky’s Haley Libs led both teams in kills with 11 while Natalie Hardig contributed nine kills and two blocks. 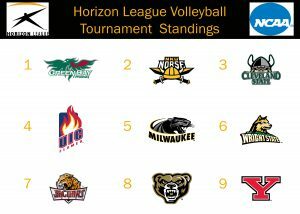 With the conclusion of the matches on Saturday, the championship contenders prepared to meet the following day for the Horizon League Championship. On Sunday afternoon, both teams took to the court in the last Horizon League match of the year. Northern Kentucky started the set with the serve and a strong lead, notching multiple kills and stopping the Green Bay offense with their blocking. Green Bay used both of their timeouts early in the game as Northern Kentucky led with a 14-10 lead. But after the second timeout, Green Bay continued to chip at the Norse’s lead and never looked back. Between her blocking and hitting, Taylor could not be stopped. With a block against Northern Kentucky’s Bailey Western and three kills of her own, the Phoenix pushed ahead to take a three-point lead on the Norse. Continuing to play with heart, the two teams rallied against the other until Ashley Sledge ran a slide behind the setter, getting a kill cross court. On that swing, the Phoenix took the first set 25-22. The second set told a different story. Green Bay started with the serve and took an early lead on the Norse with the help of Vanessa Buman’s serve. She went on a five-point run early in the match to give her team a small lead to start the match. Although the Phoenix captured an early lead, the Norse were not letting them get away. Northern Kentucky fought their way back into the match, going on multiple runs to make up the points lost. Neither team let up on the other, each player putting it all on the line to make the plays when it mattered. Both teams went point for point, siding out immediately after the other team got the chance to serve. It wasn’t until the end of the set when Taylor got three kills in a row that the match concluded with Green Bay taking the set 27-25. With that win, the Phoenix were up 2-0, only needing one more set to punch their ticket to the NCAA tournament. With Northern Kentucky serving to start the third set, Green Bay took an early lead and kept the momentum. The closest that the Norse got to tying the was in the middle of the set. Maddy Weber went on a four-point serving run, getting Northern Kentucky within one of Green Bay. But once Green Bay got the ball back, they created a gap between them and the Norse. After multiple runs by Phoenix players, Green Bay closed out the third set, sweeping Northern Kentucky 3-0. Once the ball flew out of bounds from a Northern Kentucky player, the Phoenix fell to the floor in a huddle, taking in the moment. They won the Horizon League Championship. They are going to the NCAA National Championship. This marks the first time since Green Bay won the conference championship and the first time since 2003 that they earned a bid to the national tournament. And for three players, they got more out of the tournament than just a bid to nationals. Jessica and Yoss both earned All-Tournament team honors along with Northern Kentucky’s Libs and Hardig, Cleveland State’s Hannah Greene and UIC’s Kiera James. Clinching the award of tournament MVP was none other than Taylor. She finished the tournament with 47 kills, 26 digs and seven blocks across seven sets. Green Bay got a moment to reminisce on their accomplishment as they prepared for their biggest challenge this season with the first round of the NCAA tournament Nov. 29. EDITOR’S NOTE: Although the Phoenix lost to the Badgers in three sets, Green Bay is happy with the season and how it ended.